Before you take a single step off the ground, every tower climber needs to think carefully: are you trained? Because without training in being a tower climber, it can be incredibly dangerous to do this job. Just like any career with a high amount of peril, without the right courses and education you could really hurt yourself, or allow other people to be hurt. That is not what you want, and that is why you will need to take some training courses to become a certified tower climber. It may seem that paying for training seems slightly extortionate, considering that many companies will refuse to employ a tower climber without certification and you haven’t been able to earn any money yet! But that’s exactly the point: you will find it incredibly difficult to find any work without the relevant paperwork, and so it’s vital to get your training as soon as possible. The sooner you start to train, the sooner you will finished and gain your tower climber certification, and the sooner you gain that, the sooner you can start climbing towers and earning money. One of the most popular companies that offers brilliant training to tower climbers that are looking to gain their certification is ComTrain. 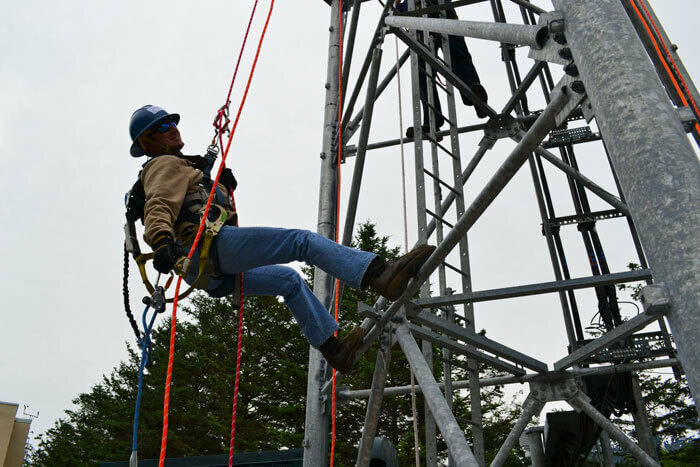 Considered one of the highest levels of training, you cannot go wrong by becoming a certified tower climber under ComTrain’s watch. You need to ensure that any training and certification that you do receive, however, follows all of the very stringent OSHA criteria for tower climbers. That’s the Occupational Safety and Health Administration, for those that don’t know. You will also need to meet the American Society of Safety Engineers, or ASSE standards during your training, and any courses that you do take should follow any guidelines set out by the American National Standards Institute, or ANSI. After all, there is no point spending all of this time, effort, and money on courses that no one recognizes! To become a certified tower climber, you will have to wade your way through an awful lot of paperwork. Don’t forget, as well as all of things training and certification that you have to go through, you will also need to make sure that you have sufficient insurance for you to work. Many companies demand insurance of at least $5 million dollars! So get your accreditation, and start work as a certified tower climber!